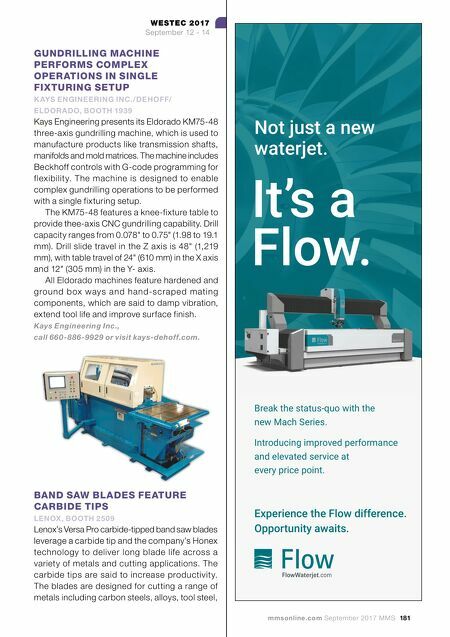 180 MMS September 2017 mmsonline.com WESTEC 2017 September 12 - 14 INDUSTRIAL PRESS, INC. Serving the Machining and Metalworking Industries Since 1883! RECEIVE A 20% DISCOUNT ON ALL OF OUR BOOKS WHEN YOU ORDER ONLINE AT WWW.INDUSTRIALPRESS.COM, OR BY PHONE, FAX, OR EMAIL. BE SURE TO MENTION SPECIAL OFFER #MMS09-17. O FFER EXPIRES 10/15/17 32 Haviland Street, South Norwalk, CT 06854 Toll-Free 888.528.7852 Fax 203.354.9391 Email: info@industrialpress.com Website: industrialpress.com Digital Store: ebooks.industrialpress.com C OMING S OON N OTABLE N EW R ELEASES THESE AND MORE ON DISPLAY AT WESTEC BOOTH 2618! UPDATED, REVISED, AND EXPANDED M ACHINERY ' S H ANDBOOK , 30 TH E DITION 2016, 2,896 pages, Illustrated T OOLBOX : 978-0-8311-3091-6, $105.00 L ARGE P RINT : 978-0-8311-3092-3, $125.00 CD-ROM: 978-0-8311-3093-0, $105.00 G UIDE : 296 pages, 978-0-8311-3094-7, $19.95 P OCKET C OMPANION : 352 pages, 978-0-8311-3095-4, $24.95 "Beginning AutoCAD 2018 Exercise Workbook." Industrial Press Inc., call 888-528-7852 or visit industrialpress.com. 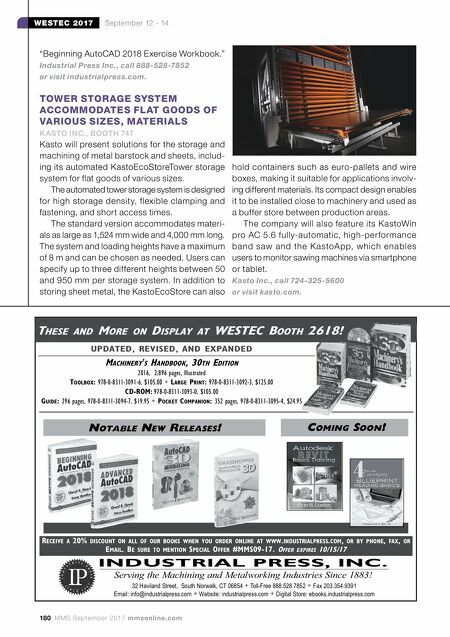 TOWER STORAGE SYSTEM ACCOMMODATES FLAT GOODS OF VARIOUS SIZES, MATERIALS K ASTO INC., BOOTH 747 Kasto will present solutions for the storage and machining of metal barstock and sheets, includ- ing its automated KastoEcoStoreTower storage system for flat goods of various sizes. The automated tower storage system is designed for high storage density, flexible clamping and fastening, and short access times. The standard version accommodates materi- als as large as 1,524 mm wide and 4,000 mm long. The system and loading heights have a maximum of 8 m and can be chosen as needed. Users can specify up to three different heights between 50 and 950 mm per storage system. In addition to storing sheet metal, the KastoEcoStore can also hold containers such as euro-pallets and wire boxes, making it suitable for applications involv- ing different materials. Its compact design enables it to be installed close to machinery and used as a buffer store between production areas. The company will also feature its KastoWin pro AC 5.6 fully-automatic, high-per formance band saw and the KastoApp, which enables users to monitor sawing machines via smartphone or tablet. Kasto Inc., call 724-325-5600 or visit kasto.com.